Those of us with our roots planted deeply in southern soil and the southern way of living might take these beautiful rhododendrons for granted. After all for most of the year the shrubs are not much in the way of lovely. Until they bloom that is. When the blooms start popping out in bright magentas and pinks and corals and even brilliant white it's as if the whole world is gleeful. From the effects of winter. The sting from perennials frosted back to the ground and brown sticks of dormancy not as noticeable as all this color emerges. 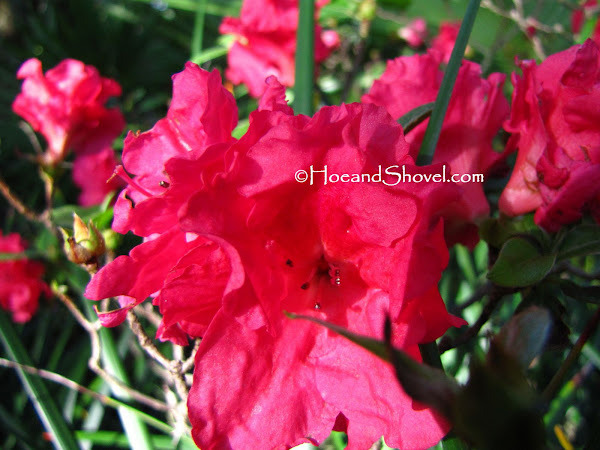 Azaleas are one of the first signs that the seasons are transitioning. They light up the garden with hundreds of bountiful flowers radiating the glistening sunlight and standing proudly underneath majestic oaks. Truly the glories of late winter. An icon of the south. 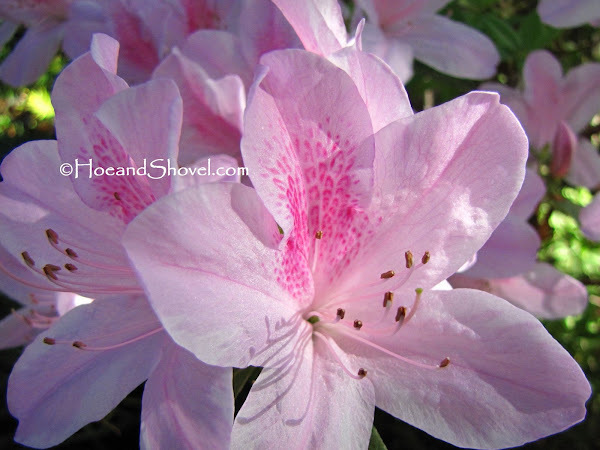 Southern Indica Azalea prefer acidic soils rich in organics. I prefer to let mine grow naturally utilizing soft pruning occasionally; refraining from buzzing them into straight-edged hedgerows. Spring visits us first down here in our southern peninsular and winter shows up for us last making for a very short dormant season. It is what we love about Florida. Mild, brief winters. 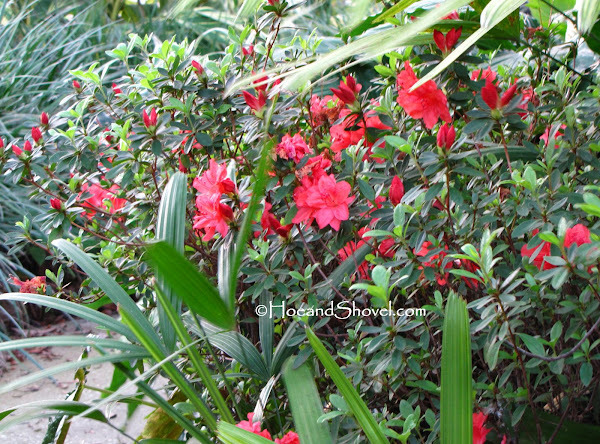 And azaleas that bloom before winter's end. They do make absolutely stunning displays. Such an array of pretty colours. I think they can be forgiven for not looking all that great for the rest of the year. 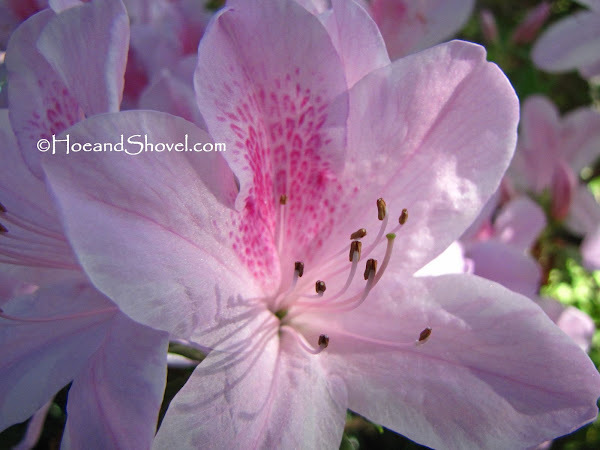 Beautiful Azalea images and you know they look fabulous while enjoying the garden in person. Dr Hartman was here Thursday bringing the Caladiums for the new plant and trial garden that will be planted outside the Epcot gate at the Dolphin and Swan hotels on April first. Visit in mid to late April through May to see the new caladiums and and all the new flowers for 2012 growing in the beds and labeled for pictures. I look forward to your Classic Caladium story and pictures and the caladiums you grow in your garden. BEAUTIFUL!! 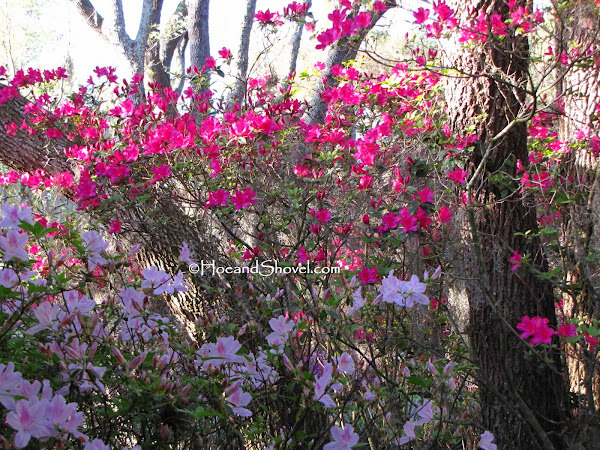 It seems like the lower the temps in the winter, the more prolific and beautiful the Azaleas are. What a wonderful way to enjoy the transition of seasons. Love the variety of colors, Meems. 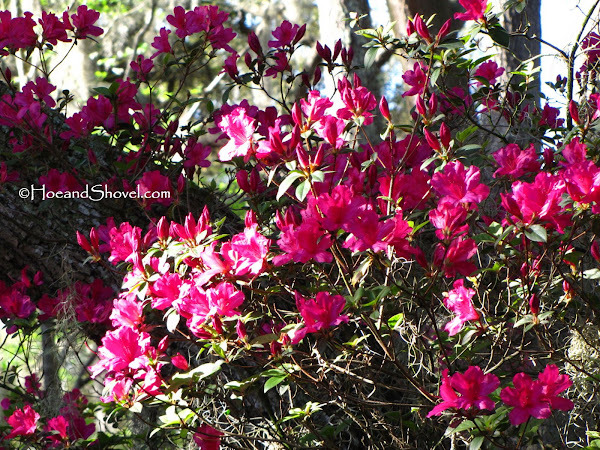 Your azalea show is stunning. You are so right that these shrubs earn their keep this time of year. I'm vacillating between doing some major pruning down of mine after the blooms fade or just giving them a trim-up. Can't decide. 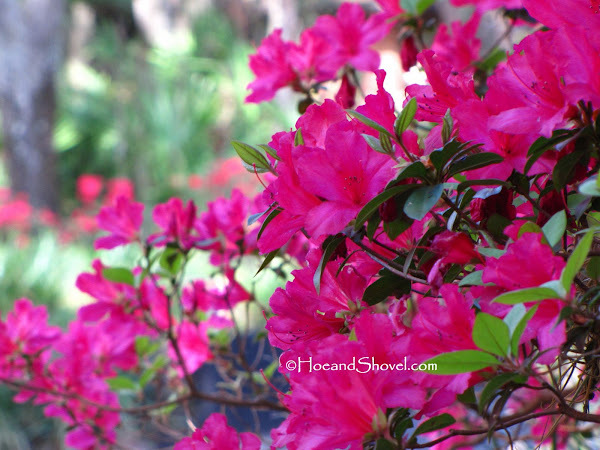 What beautiful azaleas. I just have the George Tabor and really love it. Just took a couple of cuttings to root, and I sure hope they will, so I can have more of this lovely bloomer around the property. 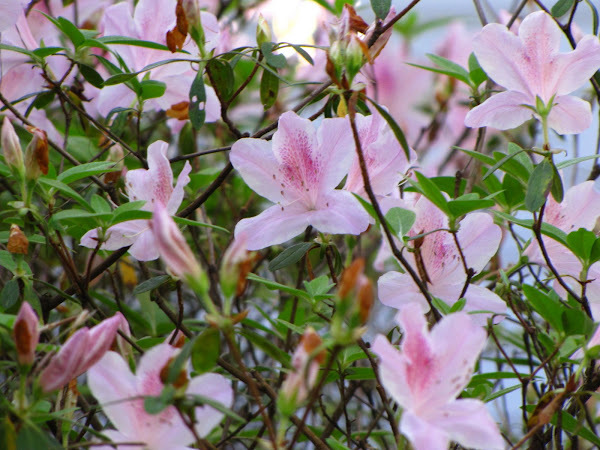 Yes, azaleas are on everyone's minds these days. Gotta love spring! 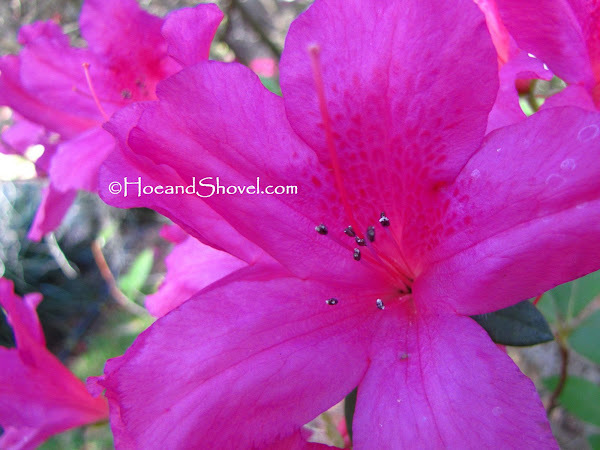 After my Bok trip this weekend, I found myself wishing I had planted more azaleas when I first moved here. It takes much foresight to choose these in our planting schemes, because they're so slow growing, but as your mature garden can attest, they are so worth it! And if they are placed correctly the fact they barely add anything to the design the rest of the year is hardly an issue. You and Dr. Hartman in one place... now that would be a good time for an indepth pick-your-brains session. :-) Epcot will be glorious with all of his caladiums and your flowers in the trials. It is true. They do appreciate that cold air and then flush out with the warming of the soil. They also appreciated the rains we were blessed with in our usually dry January. In case you don't see it above... Floridagirl would like for you to contact her (address above). All that color is spread throughout my field of vision with neighbors that have masses blooming at the same time. Makes it doubly nice for me. I haven't done a major pruning in years. Fortunately mine are situated in places where I can let them grow naturally. Are you considering this because yours are too tall or to encourage growth... what is it you are trying to accomplish? George L. Tabor is a beautiful specimen. Let me know if your cuttings take... I'll be really curious. 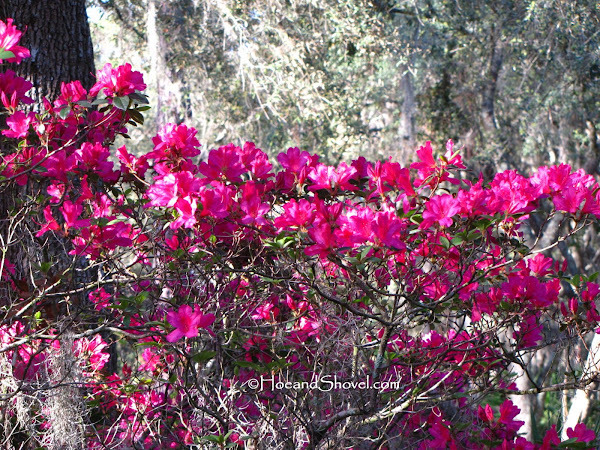 Azaleas are definitely making me feel like spring has arrived... all the warm weather is helping, too. It seems most people decide to plant them when they are blooming as they are so attractive at that time. And it is one of those shrubs that causes lots of attention for about 6 weeks. No problem with the message to SS... I also mentioned it in my comment to her in case she doesn't see yours. 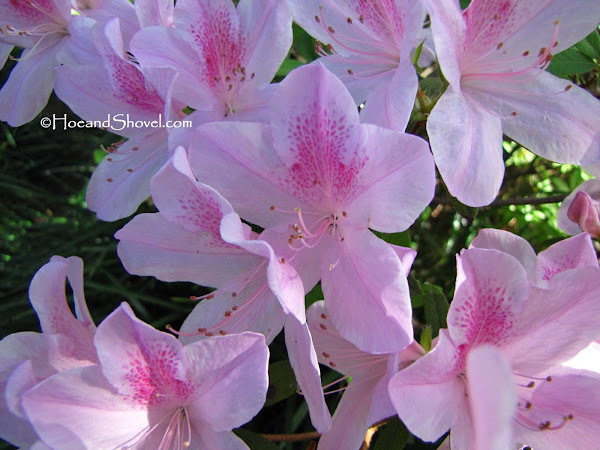 Ah, lovely azaleas, Meems! You're right -- place those spring bloomers in the right spot and it really doesn't matter what they do the rest of the year. Funny, you and I have polar opposite conditions. Everything that grows great for you does not for me, and vice versa. 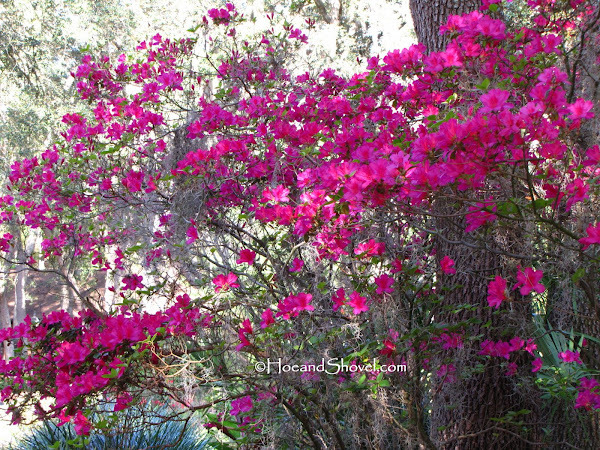 Azaleas do not like my oak-free, shade-free yards, so I satisfy myself driving around Tampa and enjoying everyone else's. 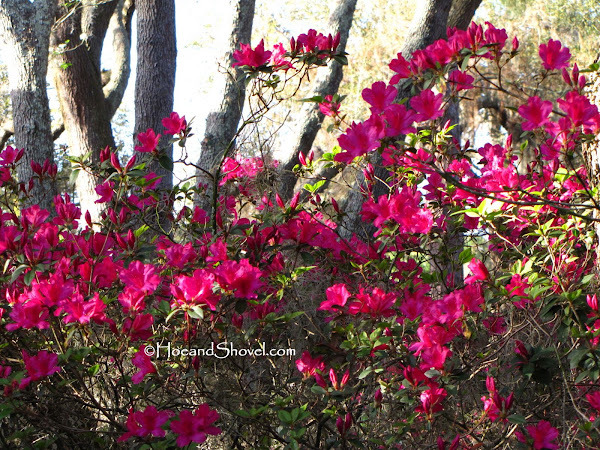 Meems: Your azaleas are surely putting a fabulous show in your garden, and I am the adudience sitting in front of the screen deeply amazed! 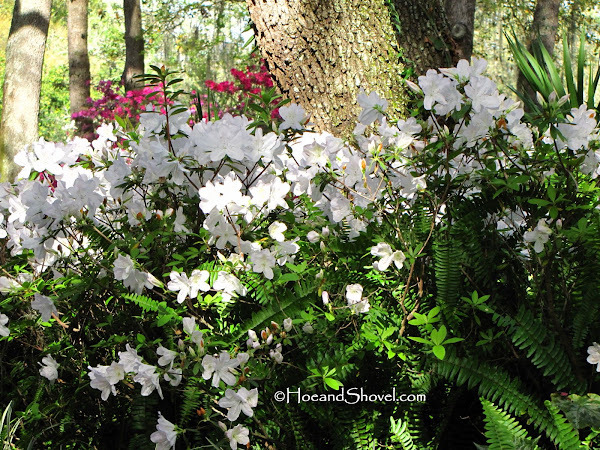 Even I don't have a single azalea in my southern garden, I have been lucky enough to visit my fellow floridian blogs to enjoy their beutiies. Thanks for the great photos, and poetic writing! They just glisten, don't they? Beautiful shots, Meems. This really makes me want ours to start blooming Meems. They are truly a garden anchor in the south. Yours are just lovely. Azaleas have really grown on me! I used to think of them as boring and commonplace, but seeing them in full bloom is definitely anything but ordinary. Thanks for the pics!